Blackburn Rovers FC and Lancashire Football Association are supporting our campaign to tackle child sexual expolitation (CSE). 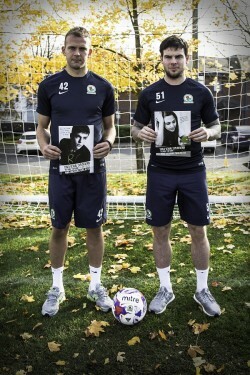 Posters with the message ‘Child Sexual Exploitation – The more you know, the more you see’ will be displayed around Blackburn Rovers stadium and will also be shown on screens ahead of fixtures in the run up to Christmas. The message will also feature in match programmes as part of Lancashire Constabulary’s long running campaign to raise awareness of CSE. Lancashire Football Association has produced a short film to raise awareness of the signs. The one minute film, which can be viewed here; https://www.youtube.com/watch?v=xLQKOnk4Axg, features cartoon drawings and children’s voices describing how any young person can become a victim and delivers some of the warning signs that are associated with a child being sexually exploited. It comes as part of a week of activity which will focus on staying safe online. Police officers will be visiting schools and childrens centres to speak to young people about their own safety. Local awareness raising events will also take place and in some areas there will be theatre productions in schools and at youth clubs. A special conference for young people will take place on Wednesday 11 November where pupils and students from across Lancashire will be able share ideas and talk about the issues and share ideas about staying safe on the internet. If you are worried that someone you know is being targeted, please call police on 101. In an emergency, always dial 999. You can follow activity throughout the week on our Twitter and Facebook pages, just look out for #knowthesigns.